In 2011 a group of depressed and addicted adults were enrolled in several Tafe Outreach courses, involving basic work place skills and horticulture. Mr Michael Mobbs was the mentor for the class. He managed twelve communal street compost bins in Chippendale. The Tafe Outreach groups volunteered twice a week to help Michael manage the aero bins and build new street community gardens from recycled materials. After 12 months of learning horticultural gardening skills and several life skill courses, Tafe Outreach formed three groups – furniture restoration, hospitality and composting. The composting group had five members who attended a Tafe Outreach business management course. It was during this course that the name Hobo Gro – Helping Others Build Opportunity was formed. 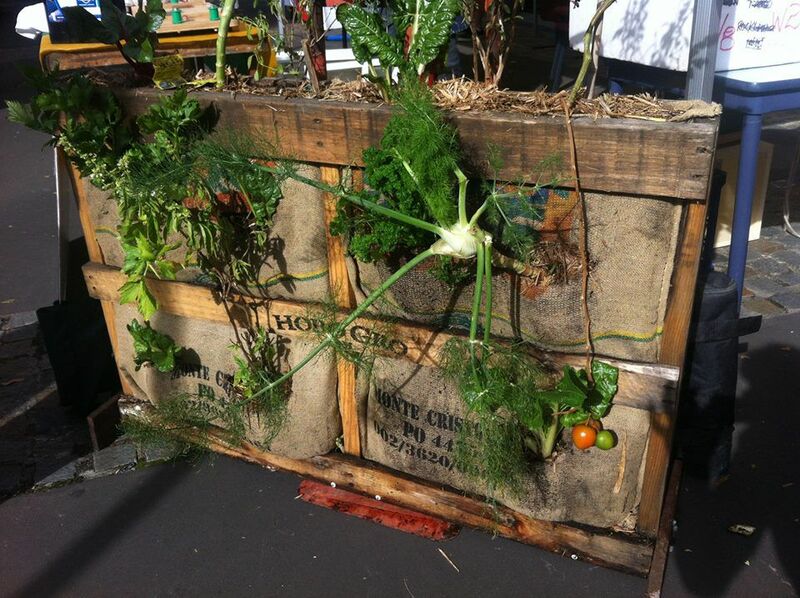 Hobo Gro’s first challenging project was in 2012, supplying (free) seventeen vertical pallet gardens, fully planted with vegetables and flowers, for the Oz Harvest Christmas party. During this period Hobo Gro was offered a space at The Addison Road Community Centre in Marrickville. Up to that date Hobo Gro’s work had always been voluntary. Consequently, Hobo Gro lost three partners for one reason or another. Hobo Gro expanded from creating vertical gardens into developing community composting systems using green and brown waste from the community centre along with other local businesses. The Hobo Gro area at Addison Road now hold 6 aero bins, 3 brick compost bays, two large shade houses, rain water tanks, worm farms (and a worm bath), collection bins and a small vegetable garden. All materials, including aero bins and worm farms, were obtained from the community and recycled sustainably. Hobo Gro gained attention from the younger community that were passionate about the environment and eager to learn more about sustainable practices. With this help Hobo Gro was able to develop some of the dreams that weren’t possible whilst working under-personed. As our products have developed and become more popular so has our team, community and client base. Hobo Gro products, being organic compost, liquid compost, along with worm products, worm farms and more recently maggots, are sold every Sunday at The Addison Road markets. Hobo Gro also grows and sells succulents and vegetables within recycled coconuts collected from the markets. All of our products are made with the ethos of reducing waste, promoting sustainable living practices and helping others build opportunity. With our qualified facilitators we will be conducting a series of sustainable living workshops in early 2016. Feel free to contact us if you have any enquiries about our products or future projects or join our mailing list to receive updates and newsletters!